Just as its namesake, the goddess Eris, the discovery of Eris (aka Xena) created much discord and strife within the astronomy community. The founding of this dwarf planet, the largest dwarf in our solar system to date, was the reason behind the 2005 International Astronomical Union's change in the definition of what a planet is and the new classification of dwarf planet was added along with other dwarf planets such as Ceres and Makemake. Eris was originally photographed in 2003 but because of its slow movement, it was not detected by the Palomar Observatory software. It was in 2005 by astronomers Michael Brown, Chad Trujillo, and David Rabinowitz of the California Institute of Technology (CalTech) re-analyzed the images that Eris was discovered and was given the name Xena in reference to the Planet X search and the popular TV show character Xena: Warrior Princess. At the time of its discovery, Brown suggested it as the 10th planet in our solar system. At the time, there was not clear-cut designation as to what constitutes as a planet. 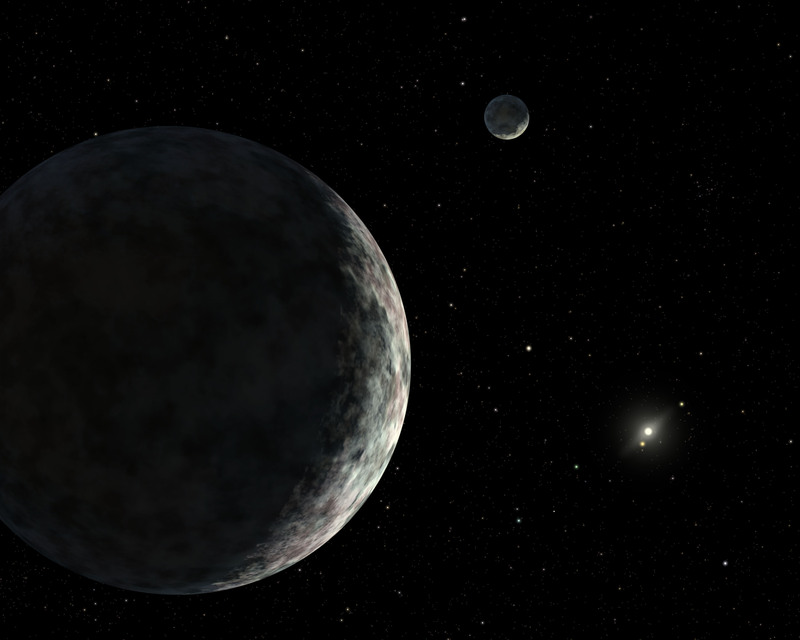 Eris' discovery prompted the IAU to better clarify this designation and create new categories, such as dwarf planets, to better identify any and all future objects discovered. Eris is approximately 10.2 billion km (6.3 billion miles) from the sun located in the Kuiper Belt in what is called the "scattered disk" and is considered a Trans-Neptunian Object (TNO). At its Perihelion (closest to the sun) it is 5.8 billion km (3.6 billion miles) and at its Aphelion (furthest from the sun) it sits at 14.6 billion km (9.1 billion miles). It takes approximately 561 years for it to complete one rotation around the sun but it has a similar rotation speed to Earth's, one day is approximately 25 hours. Eris has the most extreme orbit of all of the sun's satellites in our solar system to date. Eris is believed to be made up of a rocky body covered by a thin mantle of nitrogen-rich ice and frozen methane. No other information on this is available at this current time. Current technology and the inability to travel such a major distance to get a better understanding of Eris is not available at this time. Similarities to Eris and Pluto suggest that it may be similar in internal structure as Pluto, but may have a more solid and larger core than Pluto. Much like its atmosphere, because no probe has yet to visit Eris, not much is known about its geography except speculations. Because of its distance, no images of its surface is available at this time and it is not due to be within its perihelion until approximately the 23 century. During that time, we would have a better ability to possibly be able to gain images of the surface to get a more accurate description. Until then, it is believed that the planet retains a temperature of approximately -238°C (-396°F) which keeps its methane and nitrogen in frozen form for most of its rotation. Only during its perihelion does it turn gaseous and may create a form of atmosphere. However, during its aphelion, these gases become heavy again and fall frozen back to the surface of the planet becoming the equivalent of snow and ice on Earth. Eris is the brightest planet, 2nd most reflective body, in our solar system. The only "body" in our solar system that is brighter is Saturn's satellite Enceladus. It appears a bright white due to the methane-nitrogen rich "snow" that covers its surface. It reflects approximately 96% of all light that reaches it which is brighter than fresh snow on Earth. Called Pluto's twin in size, it was once believed that Eris was much larger than Pluto. Recent discovery's, however, proved that Eris is in fact almost the same size. Eris is approximately 2,326 km (1,445 miles) in diameter whereas Pluto is 2,374 km (1,475 miles) in diameter. That is only a 48 km (30 mile) difference. Of course, it is not known as to how accurate their calculations of either planets size, they do strongly believe that they have Eris' size correct within 11 km (7 miles). There is also strong belief that while Eris is close in size to Pluto, it is much denser, it is estimated that Eris is 27% heavier than Pluto. Because of its distance, information on its climate and atmosphere is currently unknown. We currently do not have a means to fully observe the planet and no probes have yet to visit this tiny world. There are, however, speculations that during its perihelion the ices on the surface turn gaseous from the warming and may create a sort of atmosphere but whether that atmosphere is held by its gravity which is very weak, 45 kg (100 lbs) on Earth is 4 kg (9 lbs) on Eris, is still unknown. Because of the amount of methane and nitrogen that is retained by the planet, though, there is strong belief that either the planet has an internal method of renewing its methane and nitrogen or that its atmosphere does not expel enough (meaning the planet maintains it somehow) for it to lose its content. This also indicates there may be snow and dew on the surface as its weather patterns as it goes from perihelion to aphelion in its rotation. Only one moon has been identified thus far, Dysnomia. It orbits in a nearly circular orbit around Eris and aided in helping astronomers to calculate Eris' size and mass. There have been no missions to date to Eris or any missions planned for the future at this time. All observations of the dwarf planet are done through near-Earth orbiting or Earthbound telescopes. Eris' distance from Earth makes it difficult for exploration of this planet. Even traveling at the speed of light, it would take 12 hours to reach the planet which is an equivalent of 18 years at our current spacecraft velocity.